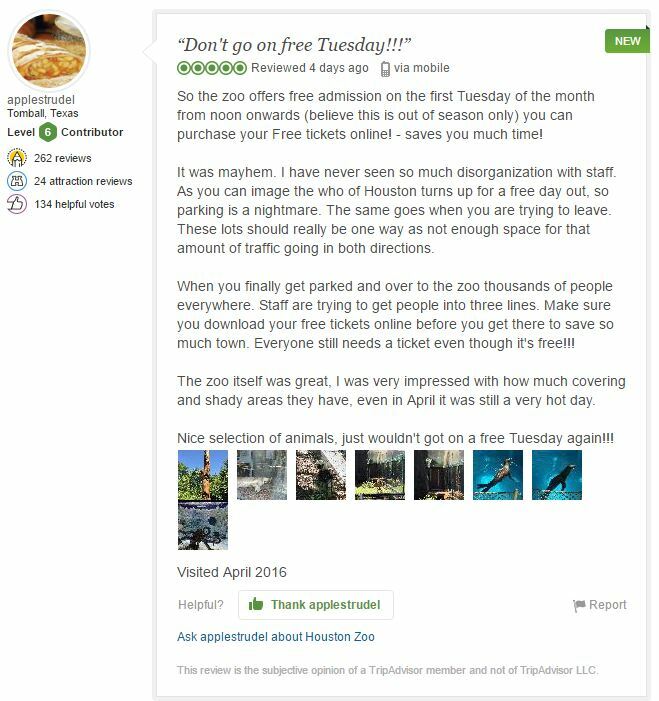 One recent Trip Advisor review of Houston Zoo – avoid Free day ! The other day there was a major brawl in Houston Zoo parking lot between a few mothers that hit the interweb. Fights in Houston parking lots are usually not newsworthy but it does bring up something we have been wanting to talk about – Free days. The Houston Zoo first Tuesday of each month, September through May, from noon until closing. Exception June – August. While some of these like the Holocaust museum are unlikely to attract the hoi polloi, some areas do so if like me you’d rather pay to avoid the crowds, make note that this. And this is not just a Houston thing either. Many cities have such free days for museums or their zoos- This post on Trip Advisor gives advice for Chicago free museum days. Here is another about Kansas Zoo free day. And if you still don’t believe us, another on the Bronx Zoo free day. Finally those who want to see the zoo scrap, here is the local news report.